Over the years, Ambassador Advisors has been blessed with the opportunity to work with families from all walks of life. Among our clients, many own small-to-medium-sized businesses. 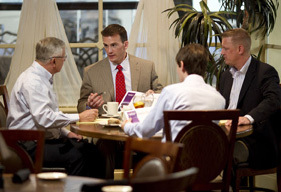 According to the Boston-based Family Firm Institute, only one-third of family businesses pass on to the second generation, and only 13% of small-to-medium-sized businesses survive to the third generation. Those are tough odds! A very similar phenomenon takes place with family wealth. Most families, simply, do not plan adequately for the non-financial aspects of handing wealth to the next generation. Until a family masters the way to sustain wealth after the third generation, each new generation is set with the task of regrowing the family’s monetary legacy. In our Family Legacy Discovery, we help families interested in sustaining family wealth, as well as endeavor to pass on the values and important characteristics that the family elders want leave with successive generations. With the help of a family wealth psychologist, our team works with the family and its trusted advisors (such as attorneys and CPAs) to examine the seed each family has nourished and what techniques are necessary to keep the resulting ‘tree of wealth’ free from falling to predators and pestilence.